Robby Morgan wants a diverse and collaborating film community that doesn't have negative elements of elitism. 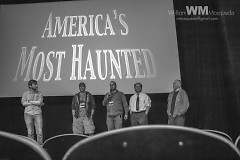 Morgan, far right, at a Q + A for "America's Most Haunted"
This story is the second installment of a series on the Grand Rapids film scene and Grand Rapids Film Festival. To read the first installment, a profile of Storytelling Pictures production coordinator Frankie Bailey, click here. The Grand Rapids Film Festival will run from April 9-13 at four locations within the city: Kendall College of Art and Design, Eve Lounge at the BOB, Grand Rapids Public Museum and the Pyramid Scheme. It utilizes a four tiered system of judging to decide award winners. After “unwatchable” films are weeded out by interns, each film is reviewed by two judges. One judge is a professional in the film industry and one judge is an amateur. 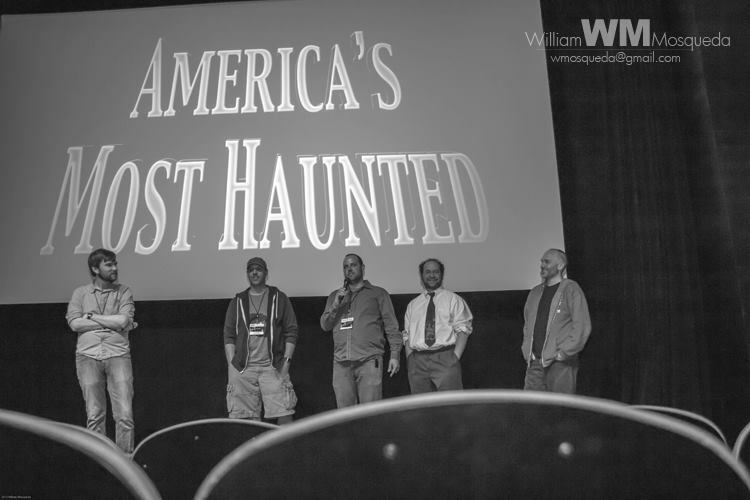 Films that are well reviewed at the second phase are screened by a small group of industry professionals, including Grand Valley State University alum John Otterbacher, Cornerstone University's Pete Mear and "Ed's Story" executive producer Daniel Dobson. Films recommended at the third stage are sent to the final panel, made up of Morgan and three other judges, who ultimately decide what films should be awarded. 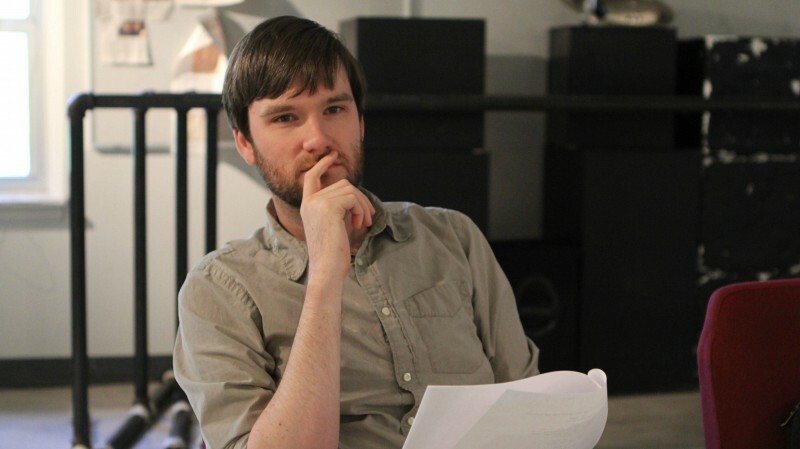 Morgan, a professional screenwriter, director and producer in his first year as submissions coordinator of the festival, oversees the entire judging process. The second phase's two judge system was his idea. Morgan grew up in Florida and majored in creative writing at St. Petersburg College from 2002 until 2006, but he dropped out his senior year after being diagnosed with thyroid cancer. Morgan moved to Grand Rapids in June 2012 when his wife had the opportunity to work with the Grand Rapids Art Museum (GRAM). He arrived without having ever been to Michigan and didn't have any connections within the film scene. Morgan’s involvement with the Grand Rapids Film Festival began when he volunteered last year as a way to develop new connections. He emceed screenings and hosted “Question and Answer” sessions about films. When the submissions coordinator position became available this year, Morgan jumped at the chance to have a more integrated staff role in the festival. Morgan continues to work on his own film projects in addition to his involvement with the festival. 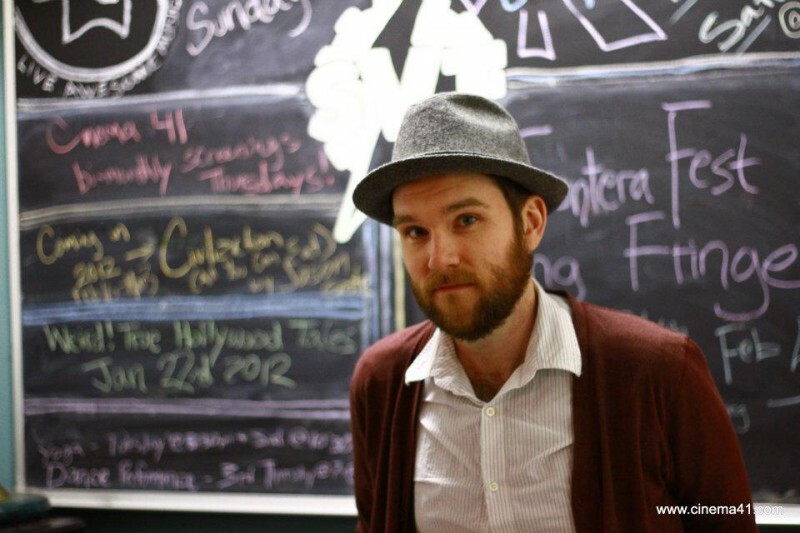 He is currently working on two series projects and is collaborating on one with Michael Dault of local TipToe Pictures. Morgan's ultimate desire is to be a screenwriter. Morgan hopes that the collaborative spirit within the current Grand Rapids film scene remains in the future. “In Austin people are compartmentalized and work with who they like to work with," he says. "Here there’s room for all of us. I’m hoping that as the scene grows here people will continue to help one another. I feel that collaboration is an important element to any creative scene. One thing we tried to push with Cinema41 was creating a film community. I feel like Grand Rapids has that starting and I’m hoping it grows and becomes stronger." The Grand Rapids Film Festival will run from April 9-13 and feature four showcases at locations within the city. In addition to film screenings, this year's festival includes scriptwriting and storyboarding workshops hosted at Kendall College's Woodbridge Building and a "Fashion for Film Showcase" hosted at the Pyramid Scheme. For more information or to buy tickets visit the festival's website or email the festival.